Just wanted to put up a link to one of my favorite Halloween decorations from last year - click over for the directions & details! 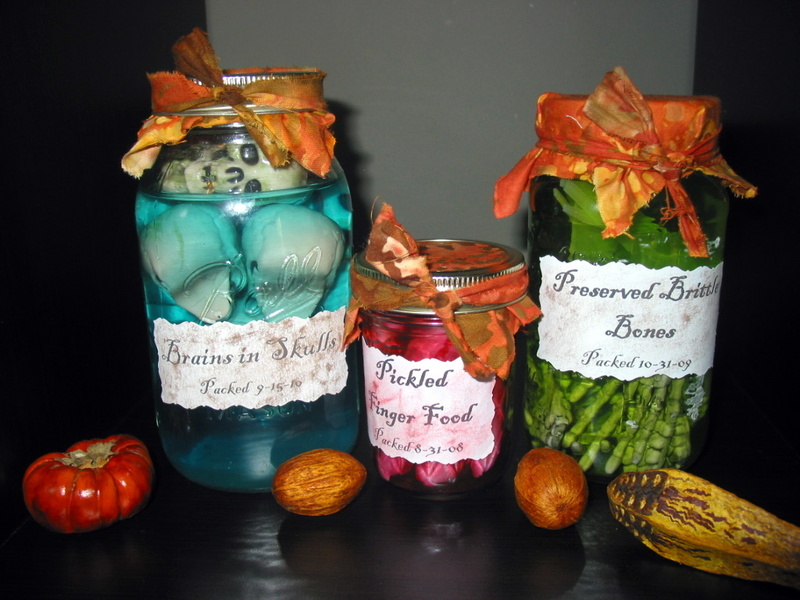 I just got the empty jars out of the attic, filled them up with colored water and put them up on one of my shelves - instant spookiness for my house this year, too! Dollar Tree has the "severed fingers" and other items you could make this with, and Michael's has the "skulls" out again too! : ) I love silly, spooky decor like this - especially when I can make it for very little money! What are some of your favorite Halloween decorations that you put out each year? I will have to check this out. I haven't heard of this idea before. New follower here from Lots of Loving Weekend hop. I hope you will take a moment to stop by my blog and check out my kind of fashion (hair jewelry). I'm not just trying to gain followers with hopping, I'm trying to spread the word about a product I love. Here's my url http://talesfrommyjournal.blogspot.com I also have a facebook page which is www.facebook.com/DeniseMartin.LillaRose I hope you can stop by there as well. It's the fastest way to hear about specials. I will go like your facebook page next. Thanks for participating in the hops at MoneySavyvMichelle.com. I'm following you back on GFC and subscribed to your newsletter. Have a great week! And your back round on the blog! EEEEKKKKK I LOVE YOUR BLOG!!!!! Everything about this is all super ubber cute! That is a great trick, very spooky too. Free DinneRevolution E-Cookbook for my readers!! How to organize your pantry! Coming soon - a really wonderful giveaway!